Welcome to Jury Service with the U.S. District Court, Northern District of Georgia. Serving as a juror is a fundamental obligation all of us share as citizens of the United States. Having citizens like you participate in the process is the only means of ensuring that our system of justice continues. Jury service sometimes requires sacrifices and may mean rearranging schedules, canceling appointments, or missing work. Yet serving as a juror is an important civic duty, as well as a privilege and responsibility. Those who serve as jurors have an opportunity to see the courts in action and to actively participate in a fundamental democratic process. We extend our sincere appreciation to you for participating, and trust that you will find your experience rewarding. 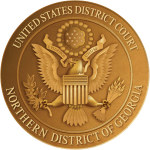 The Northern District of Georgia is a two-step court which means that jurors must first be “qualified” before they are eligible to become a juror. Once a person is qualified, their name is included in the database from which our Grand and Petit Juries are pulled. The function of the Grand Jury is not to determine guilt or innocence, but only whether there is probable cause to believe that a crime has been committed and a specific person or persons committed it. If the grand jury finds probable cause exists to suspect a person of having committed a crime, then it will return a written statement of the charges called an “indictment.” After that, the person will stand trial. Grand Jurors will be coming from locations throughout the forty-six counties of the Northern District of Georgia for regular meetings in the City of Atlanta. From a larger number of prospective jurors summoned and reporting, a Grand Jury panel consisting of twenty-three persons will be randomly selected to serve. A civil petit jury is typically made up of 6 to 12 jurors. In a civil case, the role of the jury is to listen to the evidence presented at trial, to decide whether the defendant injured the plaintiff or otherwise failed to fulfill a legal duty to the plaintiff, and to determine what the compensation or penalty should be. A criminal petit jury is usually made up of 12 jurors. Criminal juries decide whether the defendant committed the crime as charged, while the sentence is set by a judge in the case of a guilty verdict. Verdicts in both civil and criminal cases must be unanimous, although the parties in a civil case may agree to a non-unanimous verdict. A jury's deliberations are conducted in private, out of sight and hearing of the judge, litigants, witnesses, and others in the courtroom.